Months after we first heard Xiaomi would be coming to the UK, the brand has just announced it'll be bringing its latest flagship phone to market. The Xiaomi Mi 8 Pro is coming to the UK, and it's the first market outside of China to be able to buy the phone. As you can see above, the design of the phone features a clear glass element that shows you the internals of the device. Those are dummy components that you can see, but it gives the phone a different look to almost any other phone on the market. There are red accents to the design around the camera and on the power button too. It features a 6.21-inch AMOLED display with a notch at the top to give it a full-screen design. On the rear of the device is a dual camera with two 12MP lenses working in tandem. It has 4-axis OIS as well as 2x optical zoom and a variety of artificial intelligence features to improve your image quality in auto mode. Inside is a Qualcomm Snapdragon 845 chipset paired with 8GB of RAM. There’s one storage version at 128GB, and it’s currently unclear if you’ll be able to use microSD cards with the phone. The battery is 3,000mAh, which is less than that on the OnePlus 6T. It also runs Android 8.1 software right out of the box, but it includes the Mi UI overlay that the company uses. Xiaomi launched the Mi 8 Pro earlier in the year, but the UK is the first country to get the handset outside of China. It’s set to cost £499.99 in the UK, and you’ll be able to get it exclusively on Three or from a variety of third-party retailers including Amazon, Argos, John Lewis, Carphone Warehouse and Xiaomi’s new store in London if you’re happy to buy the phone outright. The Mi 8 Pro will go on sale from November 9. 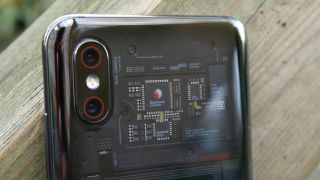 The company has also brought the Mi 8 to the UK too, and that offers similar spec but there are a couple of missing features as it doesn't include the in-display fingerprint scanner. The company also revealed you'll be able to buy the Xiaomi Mi Band 3 from a variety of third-party retailers. You've been able to buy the Mi Band 3 in the UK through other channels since earlier this year, but this is the first time Xiaomi has specifically sold it. That’s set to cost £26.99 from Three, Amazon, Carphone Warehouse, Currys and a variety of other retailers. If you hurry, you’ll be able to buy the band for £19.99 but that’s only for the first 10,000 orders between November 12 and November 23. The company has also brought the Redmi 6A to the UK which is a more affordable phone with a 5.45-inch HD display, powered by a Mediatek Helio A22 chipset and includes a 13MP rear camera. You'll be able to buy the Redmi 6A and a Xiaomi Mi Band 3 for only £99.99 with pre-orders starting on November 9 exclusively at Three. Those include a toothbrush, smart scales, a kettle and more. You can see the full line up at Xiaomi’s newly launching London store in the Westfield White City shopping center that opens on November 18.